But if you’re looking into mortgage refinancing, you’ll need to decide where to secure that financing from. And there are several types of mortgage lenders to choose between. You’ll want to know the difference to get the best deal for you. Banks, especially the Big Six banks, have the most rules and are often the hardest to borrow from, especially if you want a second mortgage. For instance, TD Financial recently announced a change to their Home Equity Line of Credit (HELOC) financing. They are now approving HELOCs based on available credit rather than utilized credit. So, for instance, if you have a $10,000 HELOC but have only used $1,000, they are still treating it like you have used all $10,000. This could be a challenge if you’re looking to access more home equity or secure a second mortgage. Banks who are federally regulated have more red tape to follow, which makes it harder to secure mortgage refinancing through. Credit unions are not federally regulated, but many still have similar rules and policies in place, and they may not lend at all to those with bad credit. Have been, or are currently, bankrupt. Have filed for, are currently in, a consumer proposal. Some finance companies may also have significantly higher interest rates, which can make mortgage refinancing more expensive to secure. 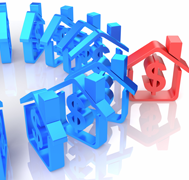 Mortgage brokers can help you find the best rate for your mortgage refinancing. They act as an intermediary between a client and a mortgage lender. However, you can also get into huge fees when you work with a mortgage broker who also isn’t a lender. The ideal scenario can be to work with a broker who can deal with banks and finance companies, but also has its own private money to lend. Usually, you will need at least 70% equity in your home to secure refinancing, but most brokers in this category won’t be as concerned if you are in a unique financial position – self-employed or in a consumer proposal, for example. At Prudent Mortgage Corp. we offer the best of both worlds. We’re licensed mortgage brokers, but we can also offer private financing through Prudent Financial. Whether you’re interested in a home equity loan, second or third mortgage, or refinance, contact us today to see how we can help. Call 1-888-852-7647 or visit www.prudentmortgage.ca.